Rye Patch, Nevada. Metal Detecting for Gold Nuggets. 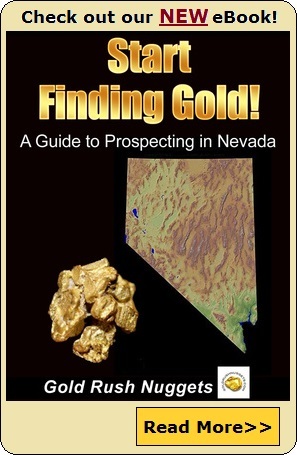 One of the best known areas in the US to metal detect for gold nuggets is the Rye Patch placer district in Northern Nevada. The area is located roughly 50 miles southwest of Winnemucca, Nevada, just west of Rye Patch Reservoir in Pershing County. It is also sometimes referred to as the Majuba placers due to its proximity to Majuba Mountain. Unlike many gold-bearing areas of the west that were discovered during the mid to late 1800’s, the Rye Patch placers were not discovered until 1938. The original discovery was made by Charles Dice, who successfully recovered several hundred ounces from his claims. The area does not have running water, so early prospecting mainly involved using drywashers to recover gold. The gold in this district is scattered over a wide area of several square miles with gold deposits throughout. The Rye Patch placers are appealing to modern day prospectors because of the unique way that the gold nuggets are distributed. Most of the gold is deposited fairly shallow in the soil, making it detectable with a quality metal detector . The limited ground cover also makes detecting easy, as the grass and desert shrubs are easy to work around when compared to many other mining areas in rougher terrain. The gold also occurs in nugget form, so it has the size required to be sensed by a metal detector. The gold that comes from Rye Patch also has distinct characteristics that make it highly collectable and valued by collectors. Nuggets from Rye Patch sometimes have a crystalline formation that is known as “chevron gold”, which has a unique look unlike anywhere else. This chevron gold is found only at Rye Patch and a few other placer districts in Northern Nevada. Not all of the nuggets have this formation, but the ones that do are a real treat to find. Gold sizes found there will range from fine gold and tiny nuggets up to quality nuggets weighing several ounces in size. Although not common, the occasional gold in quartz specimen is also recovered. The Rye Patch placers are well known by those who hunt for gold with metal detectors, and the area has been searched hard over the past several decades. Still, there is gold left to be found, and despite extensive searching the area never seems to get completely hunted out. If you are in the area, it may be worth visiting. Go prepared with food, water, and warm clothing. Although it is desert, weather can change drastically in northern Nevada, and nasty weather hit at any time. Drive slowly on dirt roads, as they are notorious for shredding tires. There are no services in the immediate area, and it is quite possible to go several days without crossing paths with another person, so be smart. Go west, over the dam and continue past the recreation area. Look for the signs of mining activity. Turn on your detector and start swinging! As always, be respectful of private property and mining claims.